Gathering place: A great deal of attention was paid to the aesthetics of the Civic Plaza in the new Weir Cook terminal. It a a pre-security gathering and concesion place. 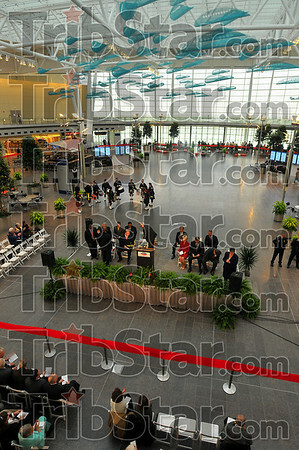 At the bottom is part of 1.200 feet of red ribbon that was cut Tuesday at officially open the new air hub.